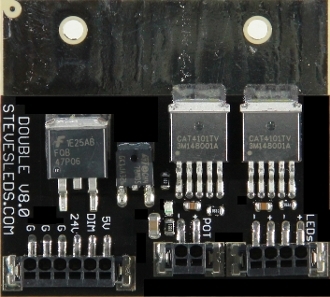 The Double LED Driver was designed to run TWO entire arrays of LEDs each with a combined forward voltage up to 25V and each. I am a freshwater guy that wanted to DIY LED bar and mount in the original Aqueon light hood of 36 gallon bow. Steve's Driver was perfect providing high efficiency and with his audio type reverse trim pot the dimming was perfectly smooth with up to 50% linear dimming. 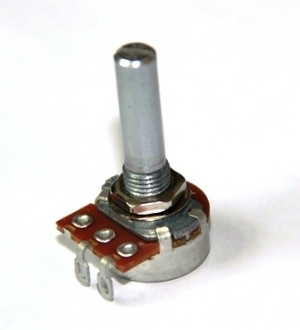 It's compact, solderless and accepts an imput from trim pot or/and PWM so lots of options. For heat sink I used the local Radio Shack aluminum heat sink (2 each) designed for TO-220 and 202 and mounted end to end. With the one part heat sink adhesive I got from Steve's they worked extremely well. Don't forget to trim your adjustable power supply to match your forward voltage total of your array, reduces heat even more. I really like the quality, size, flexibility AND the price. -Operating Frequency of the driver - 5 MHz! One of the fastest driver chips on the market! ZERO flickering when dimming! - 3 year limited warranty against manufacturing defects. Steve's LEDs, LLC will determine the nature of the defect, and your item may be repaired or replaced free of charge.